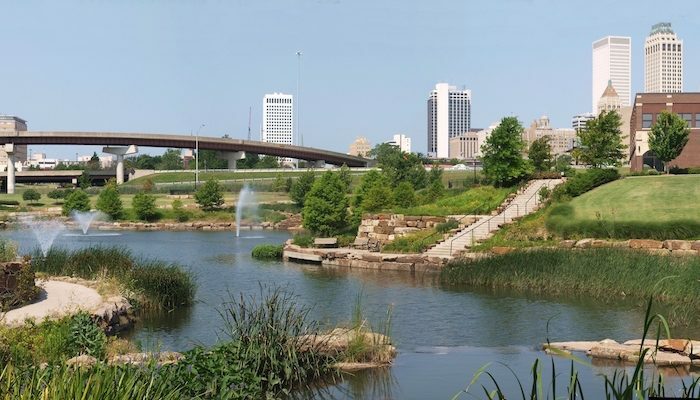 The city of Tulsa has cleverly developed the banks of the Arkansas River into a series of “River Parks,” which include a number of long linear paved paths that are perfect for running. Runners can find trails along both the east (downtown side) and west banks. On the east side, the trails start from 11th St. (near downtown Tulsa) and run south for nearly 11 miles south to 101st St. This is one of the most popular sections for running as the path includes separate cycling and pedestrian lanes separated by a median. On the west bank, the 7 mile trail runs from 11th St. south to the Turkey Mountain Wilderness Area at 71st St., where it connects to a number of scenic dirt trails. Pedestrians and cyclists share a single lane on this side of the river, but the way is divided by a painted line. 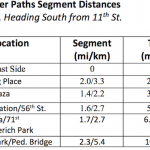 There are pedestrian bridges at 11th St., 23rd St., and 71st St., where runners can create a loop of various lengths up to 14 miles. Both banks of the river are well-lit, but runners should recognize the city of Tulsa enforces a curfew between the hours of 11 pm and 5 am. Restrooms and water fountains can be found at several locations along the way. 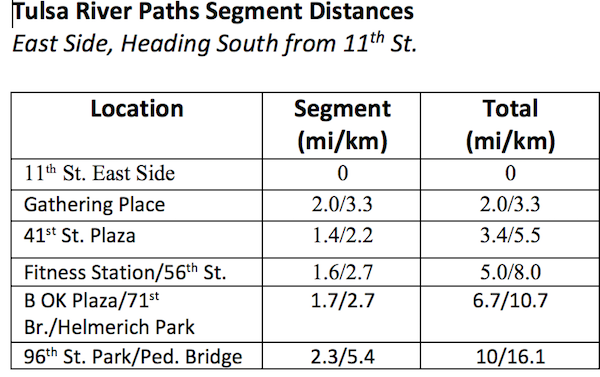 The attached trail map has key landmarks along the way, and we’ve also created a table with segment distances. Any stretch of the River Park is a great run, but some include the fitness station on the east bank at 56th Street, and Gathering Place, an innovative public park designed for exploration and education. With over 13 miles of sidewalk, Gathering Place is a worthwhile running route on its own or in addition to the river paths. MAP.